These are the words of Tim Firth, writer of the new hit show The Band which has taken to the stage at HM Theatre this week. And I have to say I agree. Music has this ability to transport me somewhere that seems a million miles away and at the same time takes me back to a moment in my life I still long for. As a child of the 80s I grew up with the sound of Take That pouring out my ghetto blaster, and while I have always enjoyed their music I was never one of those hard-core fans who would have travelled to the ends of the earth to see them. And until I watched The Band in Aberdeen this week I had no idea how profoundly I had been shaped by their music. The play focuses on the lives of a group of young girls, who like me, went to school in the 90s. They form a tremendous bond which is unexpectedly broken by tragedy and results in their futures taking turns down paths they were not prepared to go down. Playing on every emotion the script grips you instantly while the music and stage setting smacked me with nostalgia. 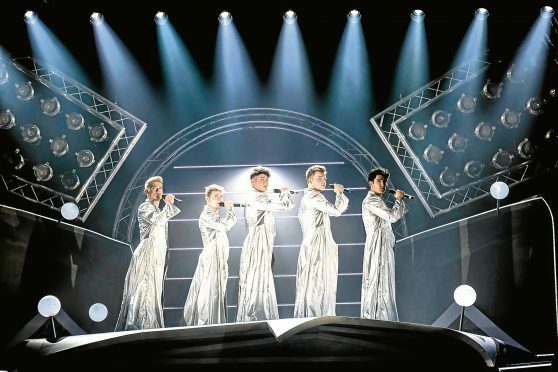 The girls (who later turn into women) were also all excellent, likeable, relatable and funny and the boys in Five To Five did justice to the Take That songs which shape the storyline and guide you through the plot. While I love attending the theatre, and am often moved to tears, nothing has affected me in such a way as this did. From around 10 minutes into the first act I started to cry and didn’t really stop until I left HMT. However, through my tears there were moments of laughter, a sudden surge of great memories, and a whole lot of appreciation for the fantastic cast and excellent music which allowed the musical to Shine.